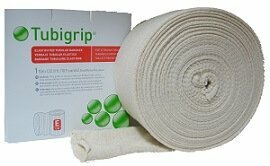 Tubigrip is a specially designed, elasticated tubular bandage that provides firm but comfortable support for sprains, strains and weak joints. It is one of the best ways to provide support and reduce swelling after injuries, and can be used to help reduce persistent swelling. It can also be used to keep dressings in place. The benefits of it over other bandages are that it is easy to apply (just pull it on), it stays in place all day without the need for pins or tape and it is reusable and easy to wash.
We will start be answering some of the most frequently asked questions about Tubigrip including how to use it safely and easily and will then look in more detail about how it actually works to reduce swelling and provide support and how to use it most effectively. 1)	How Does Tubigrip Work? 2)	How Does It Feel? Very comfortable. It provides gentle support without feeling tight, so it doesn’t limit movement at all. Also it doesn’t get itchy and doesn’t fall down! 3) What Size Do I Need? Sizes vary from A (smallest) to L (largest). The correct size will depend on which body part you are using it on, and your body shape. See our Size Chart to identify what size is right for you. 4)	How Expensive Is It? 6)	How Do I Wash Tubigrip? 7)	What Options Are Available? 8)	What Is It Made From? 9) Can I Wear Tubigrip At Night? 10) Should You Wear It When Exercising? You can wear tubgrip when exercising for support, but bear in mind our muscles should be able to provide all the support we need. If the knee is feeling weak, carry out knee strengthening exercises daily without wearing the compression bandage and as the muscles get stronger, you should be able to wean off wearing it for more strenuous exercise. If you keep using it long term, it can lead to muscles becoming weaker because they don’t think they have to work as the tubigrip is doing their job. This will likely result in longer term knee problems. 11) How Do I Put It On? Tubigrip is really easy to apply. We have put together a page on how to apply including top tips on how to apply it and keep it in place, as well as how to choose the right size for you. With any injury, there is often swelling. Although some swelling is inevitable, too much swelling results in significant loss of function, excessive pain and eventually reduces the blood flow through vessel restriction. This slows the healing process and can be painful. The most effective way to apply and maintain compression on the knee is to use a tubular compression bandage rather than a firm plastic bandage (such as zinc-oxide tape). Usage of a tight, non-elastic bandage will result in reduction of adequate blood flow, potentially causing ischemia. Another way to reduce swelling is to use ice. Visit the ice treatment section to find out more about how to use ice safely and effectively to reduce swelling. Tubigrip can be used to help support a weak and painful knee. It is most useful in the first few days after an injury. 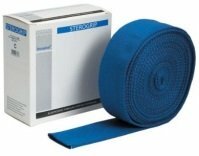 It is important to wean off the support of the tubigrip compression bandage as soon as possible, certainly within a week, otherwise muscles are likely to get weaker due to not being used. 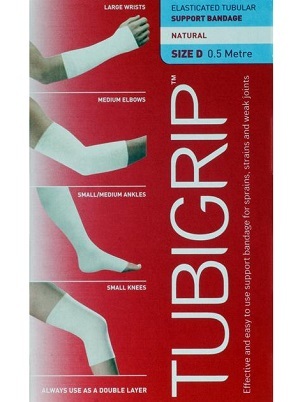 NB it is ok to wear it for longer if you are using it to reduce swelling rather than to provide support. Tubigrip should always run from the just below the joint above where the injury is to just above the joint below e.g. if treating the knee it should go from the top of the thigh to the ankle. It should always be worn double thickness. The simplest way to do this is by folding over a single piece, rather than using two separate pieces. Visit the How to Use section for diagrams and top tips on how to apply it including how to stop it from rolling down and how to find the right size for you. It can be worn throughout the day, but should be removed when carrying out any rehab exercises to allow the muscles to get stronger. Safety Advice: DO NOT wear tubigrip at night as it may end up exerting too high a pressure on the area, reducing circulation. If you want to buy some, US customers and UK customers can find the best prices by clicking these links. Tubigrip is the easiest way to apply compression following an injury as part of PRICE treatment (Protect, Rest, Ice, Compress, Elevate). PRICE is usually the first line treatment for any injury and using it can help to reduce pain, speed up healing and prevent any further damage. Find out more about how to effectively use it in the PRICE treatment section. There’s lots more information on treating knee pain to discover such as strengthening exercises, knee stretches and if all else fails surgery. Click the links to find out more. If you want some help working out what is causing your pain visit the knee pain diagnosis section.